It’s summer! Which means that while we’re enjoying days at the pool and evenings watching fireworks, we’re certainly not enjoying the bill that comes when our air conditioners are running full-blast 24/7. The biggest energy usage in your home goes to heating and air conditioning costs. And so, you can significantly reduce your monthly payments when you start taking some smart measures in your home. Some of these are a matter of simply turning up the thermostat and learning to live with 78 degrees instead of 68 degrees. Others are a matter of optimizing your home to keep in the cool better and deflect the worst of the sun’s warming effects. 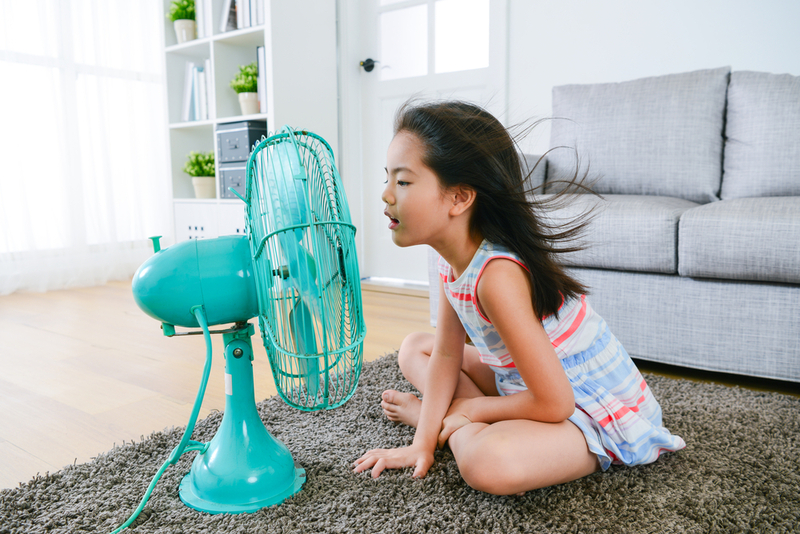 Run the fans: A fan might not seem powerful to make a difference when it gets really hot, but in actuality, it can help you to rotate air throughout the whole house, which makes a little bit of air conditioning go farther. Another clever way to maximize your fan is to hang a wet t-shirt in front of a fan. This will create a cooling effect that can make one room feel much better. Weatherproof your home: Most of us lose a lot of cold air (and allow heat to slip in) because our house is not very efficient. Caulking and sealing any cracks and holes around the perimeter of your home can make a big difference. Put weatherstripping around your door and windows to keep air from leaking through, as well. Set a timer: It’s so nice to come home to a nice cool house. However, if you’re gone during the day, there’s no reason to keep it 65 degrees in your home that whole time. Set a timer so that you can avoid wasting energy while you’re away. Spend time in the cooler parts of your house: Most of us have one or two rooms that get the bulk of the heat in the summer, and some other places that tend to stay cool. For example, if you have a den that retains the cool air really well, use it as the hub for where you spend time during the heat of the day. Open windows early in the morning: The coolest time of day is usually between 4am and 7am. If you can convince yourself to rise up early and open up the windows during that time (with fans ushering in the cool early-morning air) and close them early enough to shut out the heat, you can enjoy cool without air conditioning up until noon or so. Put shades on west-facing windows: A lot of sunshine pours in through west-facing windows. And if your home enjoys a lot of natural light, you probably enjoy a lot of natural heating too. Putting effective shades on these windows will reduce the temperature of your home significantly. Well-placed trees: A well-placed tree in your yard not only looks nice; it can also reduce your cooling costs each summer. In addition, a well-maintained lawn can reduce reflected heat in your home. Water deeply, not often, and make sure to run the sprinklers in the early morning or evening so that water doesn’t evaporate before nourishing your lawn.